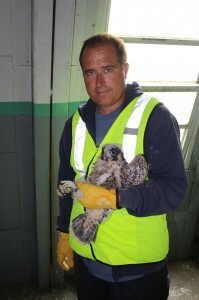 Shawn started working with Peregrine Falcons in the early 1990s and was instantly hooked. He supports falcon management and research at CCB by monitoring and banding young each year and managing the falcon web cameras. Mojica, E.K., B.D. Watts, and S.M. Padgett. 2014. Virginia Peregrine Falcon monitoring and management program: Year 2014 report. The Center for Conservation Biology Technical Report Series, CCBTR-14-19. College of William and Mary & Virginia Commonwealth University, Williamsburg, VA. 17 pp. Mojica, E.K., B.D. Watts, and S.M. Padgett. 2013. Virginia Peregrine Falcon monitoring and management program: Year 2013 report. The Center for Conservation Biology Technical Report Series, CCBTR-13-07. College of William and Mary & Virginia Commonwealth University, Williamsburg, VA. 17 pp. Mojica, E.K., B.D. Watts, and S.M. Padgett. 2012. Virginia Peregrine Falcon monitoring and management program: Year 2012 report. CCBTR-12-10. Center for Conservation Biology Technical Report Series. College of William and Mary and Virginia Commonwealth University, Williamsburg, VA. 18 pp. Mojica, E. K., B. D. Watts, and S. M. Padgett. 2011. Virginia Peregrine Falcon Monitoring and Management Program: Year 2011 Report. CCBTR-11-14. Center for Conservation Biology Technical Report Series. College of William and Mary, Williamsburg, VA. 21 pp. Watts, B. D., S. M. Padgett, E. K. Mojica, and B. J. Paxton. 2011. FALCONTRAK: Final Report. CCBTR-11-07. Center for Conservation Biology Technical Report Series. College of William and Mary, Williamsburg, VA. 33 pp. Mojica, E.K., B. D. Watts, and S.M. Padgett. 2010. Virginia Peregrine Falcon monitoring and management program: Year 2010 report. CCBTR-10-10. Center for Conservation Biology Technical Report Series. College of William and Mary, Williamsburg, VA. 21 pp. Mojica, E. K., B. D. Watts, and S. M. Padgett. 2009. Virginia Peregrine Falcon monitoring and management program: Year 2009 report. CCBTR-09-07. Center for Conservation Biology Technical Report Series. College of William and Mary, Williamsburg, VA. 19 pp. Watts, B. D., Mojica, E.K. and Padgett, S. M. 2008. Virginia Peregrine Falcon monitoring and management program: Year 2008 report. CCBTR-08-02. Center for Conservation Biology Technical Report Series. College of William and Mary, Williamsburg, VA. 19 pp. Watts, B. D. and Padgett, S. M. 2007. Virginia Peregrine Falcon monitoring and management program: Year 2007 report. CCBTR-07-09. Center for Conservation Biology Technical Report Series. College of William and Mary, Williamsburg, VA. 19 pp.